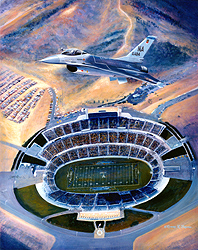 "Falcon Football" features a famous painting by Rick Broome of an F-16 flying over Falcon Stadium in 1982. The game taking place below is the Falcons against mighty Notre Dame. The Falcons won the game. The play shown on the gridiron in Rick's historic painting captures the exact second in time when Falcon quarterback Marty Louthan tripped on the five yard line after running a quarter back sneak from midfield. The Falcons scored on that drive to seal their first ever victory in Falcon Stadium over the mighty Notre Dame Irish football club. These are LIMITED EDITIONS. "Falcon Football" is counter signed by Fisher DeBerry. Get yours while supplies last.